If you'd like to learn some country western dancing styles, Texas Two Step instruction is a good place to start. The Texas Two Step is a dance done with a partner, traditionally a man and a woman, where the man leads. One of the great benefits of the Texas Two Step is that it is quite an easy dance to learn. Of course, there are fancy steps that you can add in as you become more and more advanced and comfortable with the dance, but you can be on the floor, two stepping in no time at all. The Two Step is so simple that many people watching dancers do this particular dance don't realize that it's an actual dance being done. Texas Two Step instruction is only learning how to walk to the beat of the music (of course, women have to learn to do it backwards, an added challenge)! 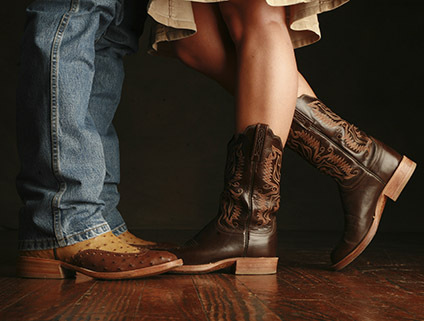 The Texas Two Step is fairly easy to learn; however, it does require sensitivity to the rhythm of the music and the ability to either lead or follow your partner. Learning the Two Step starts with simply learning the way of walking (quick, quick, slow, slow). The first two steps, done quickly, are twice as fast as the last two steps (the 'slow' steps).This dance can either be done with both partners facing the same direction or with the two partners facing each other. In the second option, the woman must be able to walk in this rhythm moving backwards. Most couples dancing the Two Step will alternate these two positions, sometimes traveling around the dance floor side-by-side and sometimes traveling in a traditional 'closed' dance position: facing each other with the woman traveling backwards. Get 2 private two step dance lessons for only $10! Singles or couples welcome. © 2015 All That Dance Studios in Louisville. Offering two step dance lessons Louisville KY. Try 2 private two step dance classes for only $10 and learn two step dancing in Louisville.